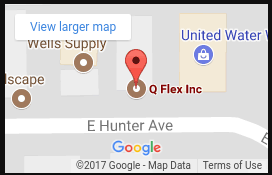 From humble beginnings with only 2 employees in a leased 1,700 square foot unit in 1998, Q-Flex has always maintained the same objective: To provide the best service for the most difficult to make flex circuitry, all at a competitive price point. Currently, Q-Flex employs a dedicated staff of highly skilled and trained 18 individuals. Q-Flex is currently run out of it's very own, custom built 18,000 square foot facility. Boasting a custom clean room outfitted with conductive flooring, state of the art air scrubbers and ionizing bars. American made flex circuitry, built to last. Our name depends on it. Our products are shipped all over the world. We have been actively involved in the community for green technologies and recycling. In continuation of this commitment, we have installed a solar light that amplifies sun light and floods the work area with bright light eliminating need for shop lights. Currently this is in preliminary testing and once the effectiveness is proven, more such lights will be installed in the front office area and manufacturing area. Qflex is an award winning Southern California based company serving the Flexible Circuit Industry since 1998.